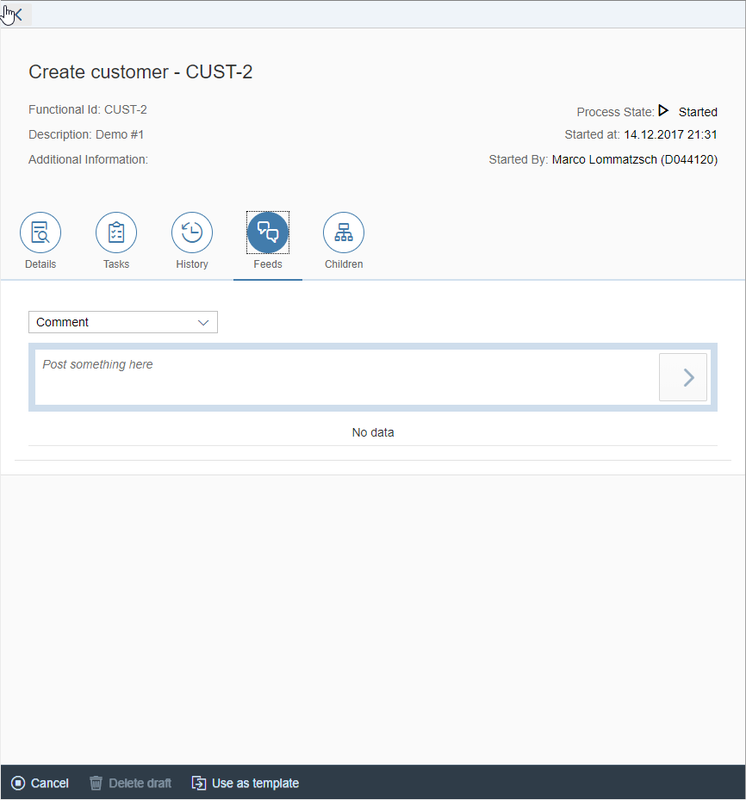 and the PDF generation with aBPM (https://blogs.sap.com/2017/12/27/abpm-step-by-step-part-4/). This time we’ll have a look at the aBPM cockpit. What is the aBPM cockpit? At the top of the screen you can see the filter area with the generic and scenario specific filters. Also it includes a collection of predefined combination of selection criteria named as “Search Parameters”. We’ll come back on this later on in this blog. It’s also possible to search via Id of the process, the user or begin and end date. If you restrict the selection on one scenario the filter will add scenario specific filter fields (if available). We’ll go into this also later on. Below the filter area you’ll find a table with the selected processes. It contains all aBPM modelled BPM processes that matches the criteria. Beside the description, the functional Id, status, user and the starting date you’ll also see additional information. This field contains supplementary information about the process, in the given example some processes maintain the information about the state they are in. 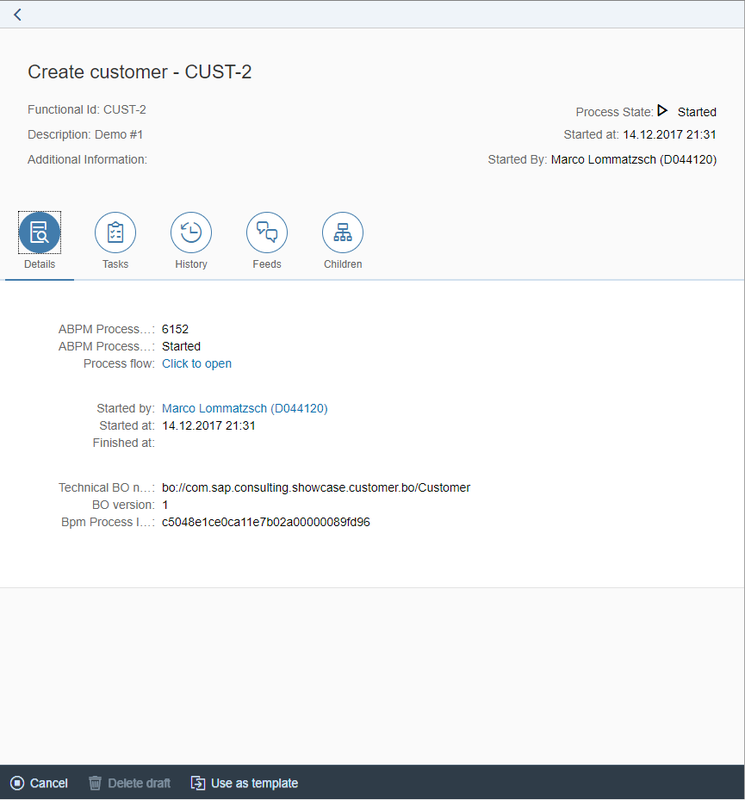 aBPM supports receiving the current state of the BPM process by providing methods in the callback interface that are triggered by BPMs JMS events (https://help.sap.com/viewer/6fc9ea54f6d3425183718b944038b882/7.5.9/en-US/4e263c830b92495c90415cc59de73b6d.html). 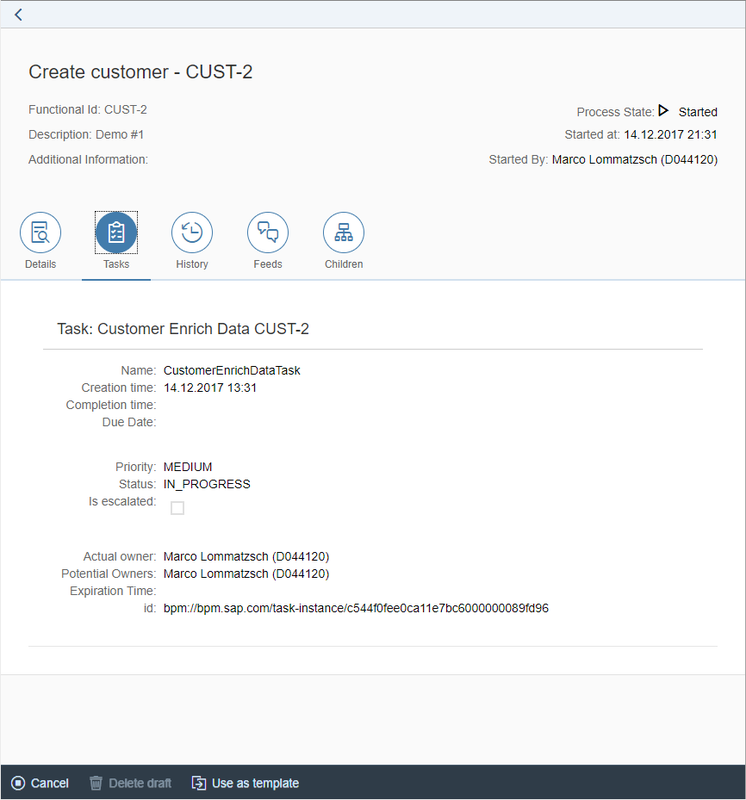 Tasks – Contain a list of tasks that were created and completed for the given BPM process. It allows you to see the process history. History – aBPM offers the creation of versions of the from data. It can be configured per scenario and allows tracking of changes. Inside the detail view of the cockpit you can see at which times the form was saved and what changes on the form data were done. Feeds – Displays all feed messages for the given process. 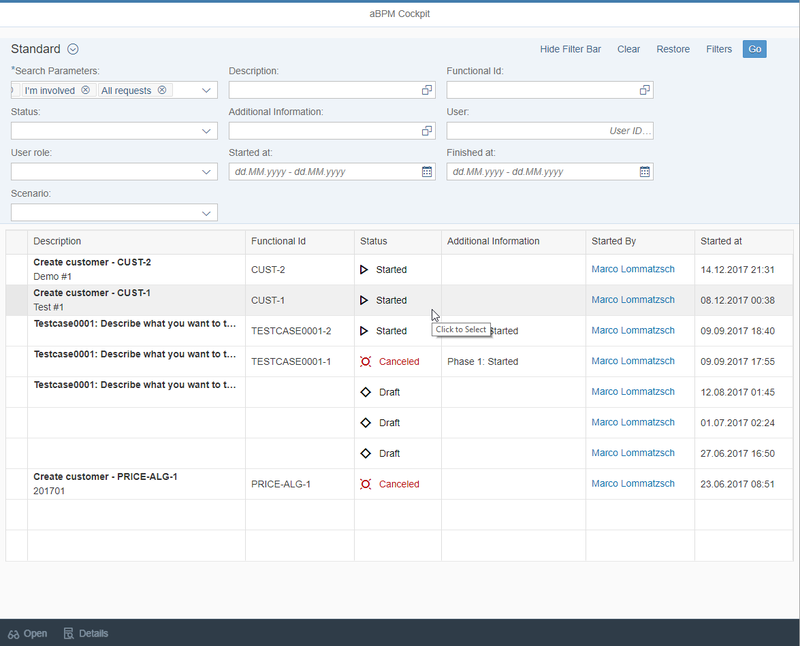 The feeds view in the cockpit is one way to work with aBPM feeds feature that allows sharing and discussing information about the process outside of the form itself. I’ll present the logic and usage later in a different blog. Children – The last view contains the “children” of the selected process. “Children” are aBPM modelled processes that are triggered at a certain time in the parent. They are different than BPMs sub-processes because from BPMs point of view they are separate BPM processes but aBPM contains logic to connect parent with its children. I’ll also present the logic and usage later in a different blog. Cancel – If you follow aBPMs modelling guide you can make use of cancelling processes. As usual you can influence via callback interface if the button is enabled. Technically the BPM process is waiting in an intermediate event if it should cancel itself. By clicking this button you would send the signal. Delete draft – If you start entering data and don’t start a process, the form is saved by aBPM in state “draft”. This allows you to stop entering data without losing the already filled data. Use as template – You can use the given process data to start a new process and avoid entering all data from scratch. If you trigger “use as template” aBPM will copy the data to a fresh from and saves you time and effort. Not all data is copied because it wouldn’t be useful to copy data that is filled later in the process, aBPM allows modifying the copied data during copy process by a callback. 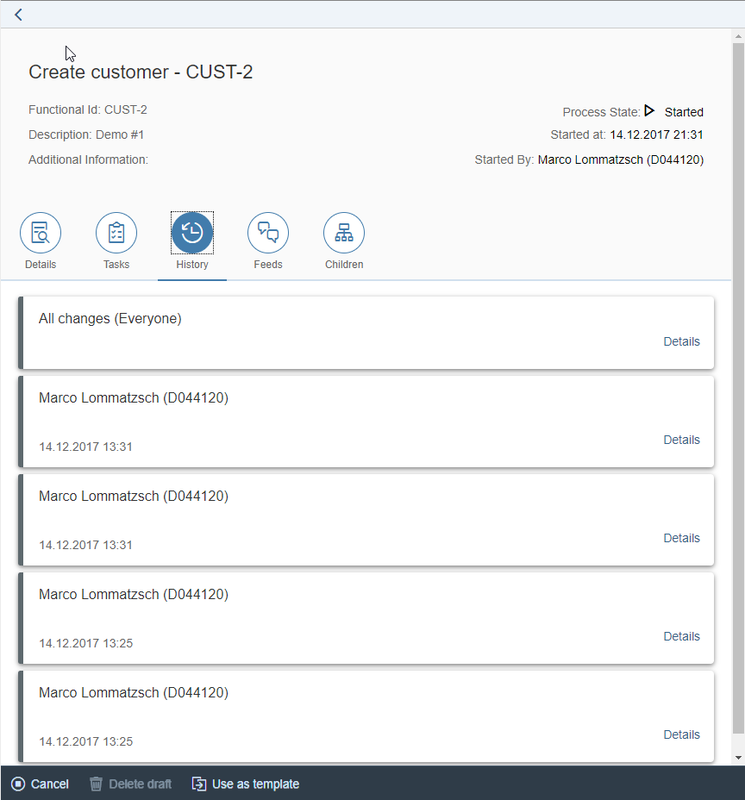 At the end of this overview you can see that aBPM’s cockpit is one central view of current running processes that allows inside in the form data as well as process execution. It’s also possible to cancel the process from there or use existing process forms as templates for new processes. If you followed my blog series about aBPM you are not surprised that the cockpit can be adapted to your needs. As usual this is done via a callback interface that is implemented in Java. search – is called before the search and computing of the search results is done. Technically this is an interface defining a session EJB. If you need to adapt the default behavior (as usual, aBPM contains a basic implementation of the interface) you need to build an session bean that implements the interface and register it in the system properties (NWA) at the key “cockpit.callback.name” with its JNDI key. Implement the interface ISearchInformationProvider with a custom class for your scenario. Return this in the queryInterface method in your scenario callback. The ISearchInformationProvider contains 4 methods, the getSearchFields defines additional search/filter fields that are added in the cockpit. The other fields aren’t necessary for the cockpit filter and handle the display state for the standalone display application and the enable/disable state of the cancel button mentioned at the beginning of this blog. Although this example is working properly it is missing translation and other aspects that are necessary for a real-live usage. This blog gives an introduction of the aBPM cockpit and how it can be adopted to your needs. I showed some extension points that allow setting of default values, definition of predefined filter scenarios and additional, scenario specific filter fields.